Do you have too much self-respect to hit the stroll? Are you too lazy to get in shape for the poles? Do you hate retail way too much to ever consider folding clothes at the Gap? If any of those apply to you fret not: You’re not completely out of options to earn extra cash. What else can you do as a good side hustle? Go green! And before you even ask, that is not a reference to anything you can smoke. Yeah, I smelled some of you celebrating 4/20, but I’m not encouraging you to sell that. I don’t need anyone trying to blame their future sentences on me. Why not channel your inner environmentalist and do a little for your pocketbook and even more for Mother Earth? You may laugh at those people picking up cans on the side of the road, but that money adds up. Besides, at least they have steady income flowing … and not many of us can say that these days. Last fall, when Hurricane Ike slapped the mess out of Houston, I spotted many Houstonians in big trucks driving around picking up pieces of metal in the street. When I asked why it was explained to me that people pay a lot of money for scrap metal. The next time there’s a hurricane I will be traveling back to my hometown to scoop enough pieces of valuable debris to make my next couple of student loan payments. Do you still think picking up metal and coke cans is a little too much to ask? I understand. Maybe you're bourgie, but there are some other ways you can save money. Be eco-friendly. Like right now, I’m sitting here typing in the dark. The past couple of days in Los Angeles have been extra hot. I’m talking levels of heat influenced by the first circle of hell. By letting the computer monitor light my room, I’m killing two birds with one stone: Helping to minimize the sweat and helping prevent a high electric bill. Don’t worry about my eyesight, y'all. I’m already blind. The minute my contacts pop out, faces turn into splotches of color. Having three light bulbs on wouldn’t help matters. My sight may be a bit off, but my taste buds are not. Get a water filter and get a new lease on life. It beats always lugging around plastic bottles of water that may not be all that safer than tap anyway. There’s a reason why the bottled water ban is gaining momentum, folks. Are you getting the point yet? It’s not like I’m asking you to drive one of those tiny cars that look like they should only be driven by Elroy Jetson. But c’mon, it’s 100 degrees in April in areas of California. That’s not normal no matter what some members of the right wing tell me. Again, this is Melyssa Ford, y'all, the video vixen! Even physically gifted twirkers are concerned about the environment. I encourage you to go green for green. I care about our planet. 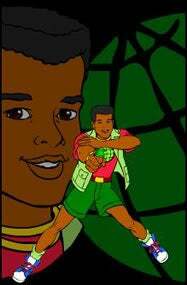 Just call me Kwame from Captain Planet. Turn off a light switch, pick up a can and rustle up some scrap metal supplied by a natural disaster. I’m trying to help you save money, and more importantly, save myself.